Yeah, that's the spirit. What does Andy Rubin, Larry Page, Sanjay Jha do after the deal that shook the mobile world? 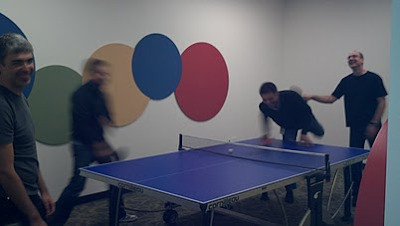 Having a nice game of Ping-Pong :). Photo by Andy Rubin on Google+ / All rights reserved. The remark that the "blur" is Sanjay Jha is awesome :) You know, that kind of sympathy, I don't feel it anywhere else. If only these guys are having my data, I feel so safe! I mean it. I would give them my money to keep it, more than any politician or any bank. And sorry, I couldn't find the name of the 4th person on the photo.